This year the Fashion Police hosts costumes were as colourful and funny as ever. From far left Kris Jenner was dressed as Psy, Kelly Osbourne dressed as Katy Perry, Joan Rivers dressed as Mariah Carey, George Kotsiopoulos as Brad Pitt from the Chanel No. 5 commercial, and Melissa Rivers as Nicki Minaj. My favorite this year was Kelly Osbourne. She looked so much like Katy Perry…. Well done Kelly! The hosts of E!’s ‘Fashion Police’ dressed up for Halloween into their favorite celebrity alter-egos!!! 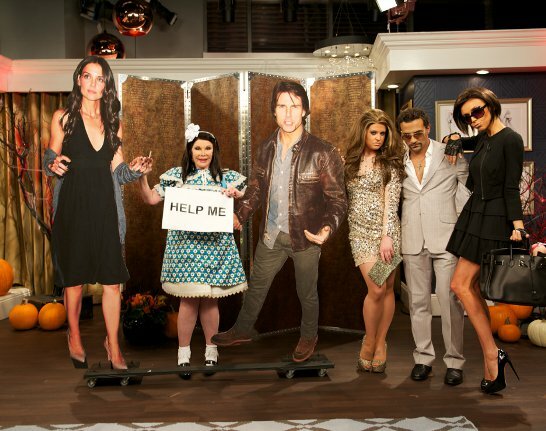 Joan Rivers dressed as Suri Cruise, Kelly Osbourneis as Jennifer Lopez with her ex-Marc Anthony aka George Kotsiopoulos and Giuliana Rancic dressed as Victoria Beckham. Below are their halloween costumes from last year….Kelly Osbourne dressed as ice teas’ wife Coco, George Kotsiopoulos was Justin Bieber, Snooki as… Snooki, Joan Rivers as Snooki, and Giuliana Rancic as Rachel Zoe. Giuliana by far wins for both years!..She got both celeb looks spot on!